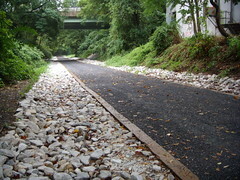 On April 24, the Prince George’s County Council passed a law that requires developers to make improvements for pedestrians and bicyclists to ensure adequate public pedestrian and bikeway facilities in County Centers and Corridors. The Washington Post article, “Prince George’s Backs Plan to ease the way of pedestrians and cyclists,” on this progressive measure, however, does not fully portray similar measures already in place in Montgomery County to improve the environment for pedestrians, bicyclists, transit riders and trail users. Montgomery County has had similar requirements for developers for almost a decade, and has moved on multiple fronts to further strengthen measures to achieve a pedestrian, bicyclist, and transit-friendly and accessible environment. Or try to. That’s the message of Tom Vanderbilt’s series this week on Slate about pedestrians–or without the perjorative that he points out–people walking. He makes a point that’s long frustrated me. Sooner or later, we all walk, even if it’s only from the parking lot to the mall. Something inside us loves to stroll. What is a mall if not a re-creation of an urban boulevard and witness the success of retail neo-main streets. No, not the bad boys your mother warned you about, but the streets you may (try to) walk along everyday. between 2000 and 2009 more than 47,700 pedestrians were killed in the United States, the equivalent of a jumbo jet crash every month in that same time period, a pedestrian was struck by a car or truck every 7 minutes while motorist deaths have dropped 27 percent in the past decade, pedestrian fatalities have fallen at only half that rate, by just over 14 percent. According to articles in the Washington Post and the City Paper, the District’s Department of Transportation has taken big steps in making the city more bike- and pedestrian-friendly. Barne’s dance crossings and hawk signals give pedestrians priority over cars at intersections, and out of a goal of 80 miles of bike lanes, 49 have been completed. 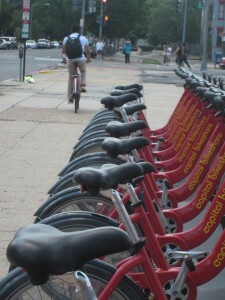 The city’s bike-share program is an early success with residents and visitors. Residents find it easier and cheaper to pick up a bike at a corner station than owning their own and schleping it into their homes. This Thursday, the Planning Board will review the County’s DHCA plans to upgrade the 25-year old streetscaping along Georgia Avenue between Selim Street and Silver Spring Avenue. The goals are to meet ADA standards and to install new soil panels that will help street trees reach full maturity. At the second event of the Rethink speaker’s series, Casey Anderson of WABA and Richard Layman of Rebuilding Place in the Urban Space talked about making (or trying to make) the suburbs more bike friendly for cyclists, both commuters and recreational riders. Anderson has interviewed 10,000 federal employees about their attitudes and experiences and found some not surprising stats—potential riders are afraid of car traffic, and some surprising ones—even those who would never consider riding a bike think it’s worthwhile to invest in bike and pedestrian infrastructure. Anderson says the take-away for policy-makers and politicians is that this is not flaky, the community will support this investment. The Coalition for Smarter Growth came out today with its Cool Communities report, that is, places that are mixed use and walkable, generating fewer auto trips and lower greenhouse gas emissions. The report has found a way to quantify diversity and local design, characteristics that are essential to community function and character, but often overlooked in more technical discussions. Based on recommendations in the executive summary, Montgomery County seems to be doing a few things right—focusing development at Metro stations and making infill development and infill transit top priorities.